Elise Joseph is a Nashville-based stylist, art director, creative consultant and blogger. She created the Pennyweight blog in 2009 as a means of documenting inspiration and sharing visual stories. Her followers glean creativity from regular postings devoted to fashion, interiors, music and art. With a keen eye on fashion and design, Elise has collaborated with leading brands, including Madewell, Steven Alan, Urban Outfitters, Topshop, Gap and Warby Parker. Her work has been featured in magazines from InStyle to The Sartorialist to Southern Living. Elise moved into a new apartment eight months ago, but a busy work schedule and time away kept her from completing the space. These days, she’s hanging her favorite artwork on the walls, finding the right pieces for her small space and inviting friends over for drinks. On a mission to design her living room, she fell in love with our Sanna chair in Livia Black leather with a walnut frame. 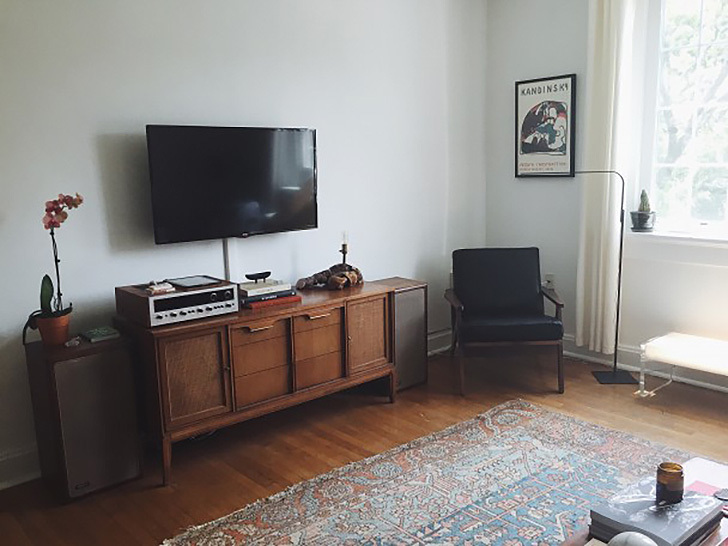 The chair now resides next to her media console, beautifully complementing its mid-century design details. 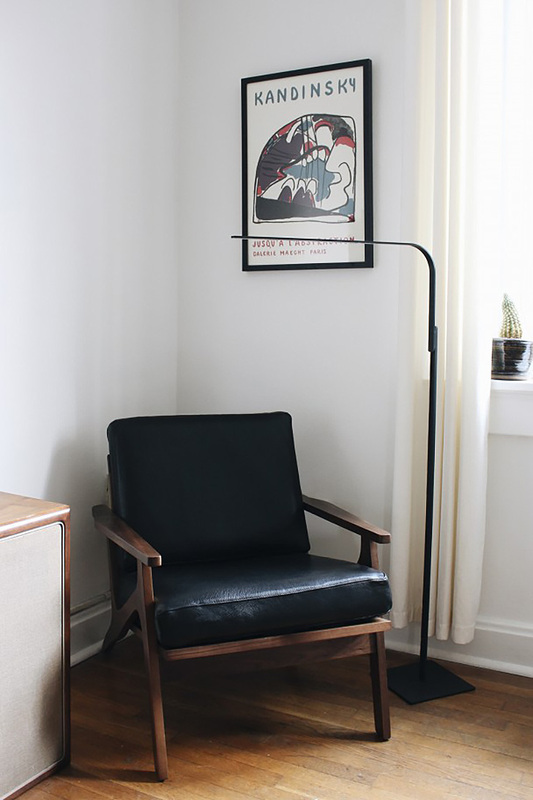 The Sanna chair sits in the corner of Elise’s living room. “Sanna adds the perfect texture to the space, with its pebble grain leather and elegant wooden angles, plus it’s made in North Carolina not very far from here. It’s extremely comfortable and durable, yet lightweight enough to easily move around when you have guests over,” said Elise. Interested in adding a Sanna chair to your home? Elise is giving one away! Enter to win now through August 31. Read on to learn more about Elise’s design style, inspiration and hometown of Nashville. News anchor. I was always so fascinated with the news, and I remember my family taking a trip to the CNN Center in Atlanta. I got to go in the interactive studio and do a fake on-air segment. We still have it on video! Intentional. I prefer clean lines and a more minimal aesthetic, opting for simple, beautiful pieces that also serve a purpose. What’s your go-to source for inspiration? Typically magazines and Tumblr blogs. I’m so visual, so I love to pore over pages upon pages of eye candy. My mom’s old black opal ring that she picked out when she was a teenager. Sleeping in, a big brunch followed by a hike around the nearby lake. A good book or board game, no technology—just spending it with the people I love the most. I know you’re a big music fan. Which songs are topping your list these days? I’ve been working on the Pennyweight mixtape for this month and can’t seem to stop playing “Moony Eyed Walrus” by Cayucas. At night I like to wind down with Max Richter. Which fashion/design trend from the past needs a comeback? I love that a high waist is making a comeback. It is a super flattering silhouette that feels classic, elegant and chic. I read a lot of books about personality types, but I’ve also been loading up on gorgeous coffee table books recently. One of my favorite novels is The History of Love, and I’ve had it on my bedside to reread. Tell us why you love Nashville! Community, accessibility, the prettiest fall season and delicious food.